With decades of experience and the power of the Volvo Group behind it, Volvo CE has installed next generation emissions-compliant engine for highly regulated markets. The Stage V–certified D4 Volvo engine is optimized for operators to get the best performance from the EC200E, providing the power, fuel-efficiency and reliability needed to succeed across a wide range of tasks. The EC200E is optimized for operators to get the best performance. With Volvo's power boost function, the already impressive lifting and digging forces are increased further, resulting in faster cycle times and optimum productivity. The EC200E's advanced hydraulics system works in harmony with the fully electric control system and Volvo CE's advanced ECO mode, to minimize power loss and improve both controllability and response times. The crawler excavator can also be factory-fitted with additional auxiliary hydraulic piping to help power hydraulic attachments and boost the versatility and productivity of the machine. The EC200E is an extremely versatile machine, one that is able to carry out many tasks for a variety of applications. Design features include a robust boom and arm, strong undercarriage, heavy counterweight and protected components, all of which enable the unit to carry out difficult tasks in tough environments. By combining the EC200E with tailor-made Volvo attachments, customers can make the most out of the machine – maximizing efficiency, hence profitability. The tiltrotator can be factory-fitted with a control system and multifunctional joysticks. Fully integrated into the machine and in-cab display, the system works in perfect combination with Volvo buckets. Whether working with soft, medium or hard materials, Volvo digging buckets provide maximum productivity and long life and feature original Volvo wear components. Volvo ditching buckets make the perfect partner for landscaping, slope shaping or ditch maintenance. Featuring 45-degree tilting on both sides, the tiltable ditching bucket is the ideal choice when a clean, smooth grade is required. Maintenance is made easy with ground-level access. Volvo hydraulic breakers are designed to work in harmony with the excavator, delivering consistent power and performance. These attachments are durable and can be fitted with a range of work tools to suit many operations. For quick and easy changes between attachments, Volvo offers a full range of quick couplers. Every Volvo machine is designed with safety as a priority and the EC200E features a ROPS protected cab, high visibility handrails and anti-slip steps. Featuring a design first for Volvo's mid-sized machines, the EC200E is now much easier to access from the right-hand side. This is made possible thanks to a new step being welded to the undercarriage and a three-point handrail above it – making climbing aboard to conduct routine service duties easier, safer and faster. The operator environment is further enhanced by excellent all-around visibility, aided by side view camera and optional Volvo Smart View that enhances the safety of operators and those working around the machine. In addition, the cab has been designed in consultation with operators to provide a comfortable working environment with reduced noise, easy-to-use controls and ergonomic layout. The EC200E is built to maximize uptime on jobsites and minimize disruption to operational activities. Long service intervals for oil and filter changes lead to a reduction in stops required; routine servicing is simplified thanks to a range of features including grouped filters accessed from ground-level, foldable guard rails, and real-time service alerts. To further improve serviceability, the radiator, charged air cooler and hydraulic oil cooler are situated side-by-side on a single layer. 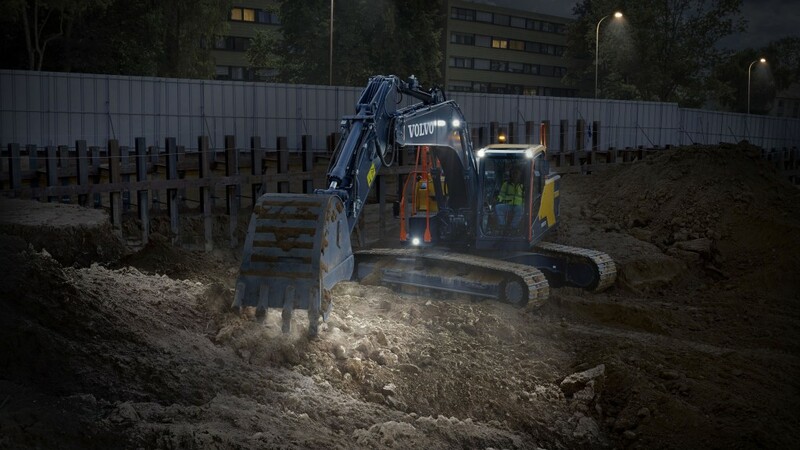 As with other excavators in the range, Volvo provides excellent machine monitoring systems on the EC200E. CareTrack provides real-time telematics data, including operating hours, location, and service alerts, helping to keep abreast of the unit's condition and performance. There are a variety of options to suit different requirements. To make life easier, CareTrack also powers a full portfolio of Insight Reports, including Health, Fuel Efficiency and Productivity. The already-made reports allow to make informed fleet management decisions without the need to sort through data and alarm codes – saving time and money. Customers can also choose to offload the monitoring of their fleet to Volvo, with Proactive Monitoring service. The EC200E crawler excavator will be on display in Munich at bauma 2019.